Since the last interview, I’ve had 2 fights. The first was in Bangkok at the IFMA 2015 Royal World Cup. I drew a Russian, Nadir Ishakov. A very lanky southpaw – your typical nightmare fight. He was about a foot taller; it was horrible! I lost a very bad decision, but I’m not fussed. It was a bit bigger than normal, at eighty-one [kgs] – I should have been at seventy-five – but I was worried about the same-day weigh-in and ended up being able to make [weight] without sweating out. The Russian went on to win silver. He fought Dmitry Valent from Belarus in the final fight. He dropped him, but ended up losing the last round and lost the fight. The scoring is funny over there. Dmitry Valent fought JWP in 2010 in Perth and, in my opinion, Valent won. So I’m not fussed about that loss at all. How did the opportunity come about for you to fight for a WBC title? I fought for a WBC state title. I’ve worked my way up the ranks now – I have three other state titles – so I simply asked the promoter if he was willing to have it sanctioned as that particular belt – it’s been a long-term goal of mine to secure it. Your girlfriend features in a lot of your training photos. She is quite a support to you? Do you train together? My girlfriend, Kerrianne McKay, is also a fighter. She’s three months older than me. We first met back when I trained at the Pit’s old establishment in Blair Smith’s shed. She came more for fitness and had no idea it was a full-on, fighters-only gym. She stuck around and I started seeing her. She then moved to Kao Sok where she now trains full-time. Six months later, I made the move too. She now has seven fights for four wins and three losses. She is the current WMC bantamweight champion. 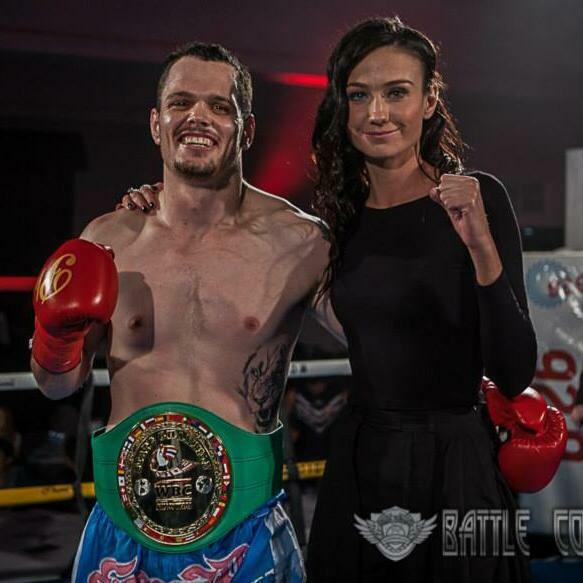 She’s recently beat names such as two-time Western Australian champ Kaitlyn Vance, stopping her in the first by KO. She also beat Loren Element (Blair Smith’s partner) by unanimous points decision, so there’s a bit of a funny history! What sort of things do you do? Do you ever spar? We do everything together: spar, clinch, run, skip . I hold pads for her on occasion; last night, she held pads for me for the first time! People think it’s great having a partner that fights. It has it’s good points and bad points. People who are single can go home and switch off easier; they go out with friends and forget about it. We love training together. We both live and breathe the sport, so it’s harder to switch off. It’s great every time one of us has to cut weight, though – we’re in the sauna sweating it out together. How is her fight career going? The gym and I all have high expectations of her; she’s a very tall, lean girl with a perfect Muay Thai body. Darren Curovic, our trainer, has referred to her as a female Dieselnoi because her knees are freaky; they hurt more than a lot of the guys, and she’s only fifty-five kilograms. I really think she’s the next big thing out of Western Australia and women’s Muay Thai and I can’t wait to see it unfold. How was the title fight? Who was your opponent? What did you know about them beforehand? How did it pan out? Tell us about the fight itself. It was originally scheduled against Scott Wilson from PTJ Muay Thai, but Scott pulled out and his stable-mate Tom Harvey stepped in. Tom had a record of twenty-two fights for fourteen wins, and I knew anyone from PTJ would be a challenge. Although I knew nothing about Tom, I knew that PTJ often come with a traditional Thai-style fight so I figured I was going to put on immediate pressure and try break him down early. I favoured my boxing for this fight and tested the waters early with a few jabs which landed well, so I came in hard after with a right cross and dropped him. The referee applied the eight-count. I followed up with more [punches] and he locked on [with a grapple] but we came free and I landed another solid right, scoring another eight-count and then, the referee decided to stop it. A lot of people I have argued the legitimacy of a Western Australian title fight being contested by someone from New South Wales. While I understand, I disagree because the current Australian champion wasn’t available. In 2012 I fought also for a WBC Melbourne title which meant that if I won, I could only defend it in Melbourne. [I felt that] I was given a bias decision loss in Melbourne. On this occasion, the belt was a sign of all the hard fights and everything [else] I’d gone through. I finally got that green belt. What does this win mean? Where to next? I’m not sure what’s next. It’s late in the year and a lot of promoters are finishing up; there’s not many shows on, so I’m just training lightly and hoping that something pops up. As for next year, I have some big goals. I would really like to get more fights and definitely fight Michael Badato from Sydney. I think he is the strongest seventy-five kilogram fighter in Australia; beating him will prove that I am the strongest. This entry was posted on September 24, 2015 at 6:53 am and is filed under Kickboxing with tags 'John' Wayne Parr, Bangkok, Belarus, Blair Smith, Darren Curovic, Dmitry Valent, IFMA Royal World Cup, Kaitlyn vance, Kao Sok Muay Thai, Kerrianne McKay, Loren Element, Michael Badato, Nadir Ishakov, PTJ Muay Thai, Russia, Samuel Ballantyne, Scott Wilson, State Title, The Pit Muay Thai, WBC, WMC. You can follow any responses to this entry through the RSS 2.0 feed. You can leave a response, or trackback from your own site.